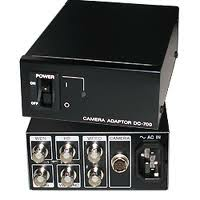 The DC-700/700CE is a small, lightweight camera adaptor compatible with all the XC-Series video cameras and accessories. It is smaller and lighter than the conventional DC-77RR and DC-777 adaptors. It is designed based on new EIAJ standard 12-pin assignment, which newly includes TRIG IN and WEN OUT, and is provided with an external synchronization I/O. The DC-700 has a power requirement of 100-110 VAC whereas the DC-700CE is made for 100 to 240 VAC.